1) This song is about a woman who works hard as a waitress. What's the hardest job you've ever had? I guess teaching. I love it though. You have to teach to many diverse learners and that is not as easy as it sounds when you are teaching several children. You also work with with many families. It is a very rewarding job, but not easy. Sometimes it is heartbreaking. 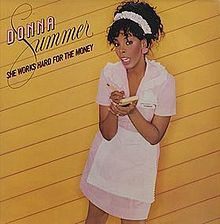 3) Donna Summer was inspired to write this song during an awards show. She ducked into the bathroom and met the elderly ladies' room attendant, whose job it was to make sure the room the spotless, the complimentary hairspray and moisturizer was abundant, and there was a hot towel for every celebrity who used the facilities. "Wow," Donna thought, "she works hard for those tips." Who is the last person you tipped? It was a waitress at my son's birthday dinner. 4) Early in her career, Donna was in the touring company of the musical Hair. It played in Munich for so long that she became fluent in German. What's the longest you have ever lived away from home? Like from my parents? 30 years. I went to college (lived in that town 6 years,..Joplin, mo) and never really moved back home with my parents. Then moved to Kansas City, MO then back to Springfield, MO. I do visit my mom every Friday now though. 5) Sam's dad is naturally outgoing and enjoys striking up conversations with waitresses, librarians, the checker at the supermarket, etc. Sam is always polite but more private. Are you more like father or daughter? daughter. I do not give information easily and I am not chatty with people usually until I get to know someone. I guess I am more private too. 7) Labor Day weekend may offer a golden opportunity for napping and sleeping in. Do you snore? I never did when I was younger, but I think I do now, I have gained weight and I am sure that is the reason. 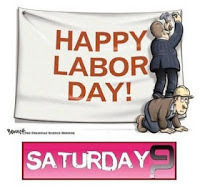 9) Labor Day traditionally marks the beginning of the fall. Will you be adding any new fall clothes to your wardrobe? not just yet. It is still really hot here. My fall/winter wardrobe is always in my closet ready to go though. I love your answer for #1. I will be a guest lecturer for "Diversity, Dispositions and Multiculturalism" for grad level teacher training at a local college. I enjoy there because it lets us get to know people more. Teaching is a wonderful job, and you sound like a very focused and dedicated teacher. I'm careful when I chat with people I don't know well, but there is so much to talk about in the world. Also, off topic, I love this look on your blog. It's very beautiful. I'm not really thinking of fall clothes yet, either. You captured teaching beautifully. I still say waitressing was a harder gig. 11 years is a long time. Teaching, I think, is hard. I tried it at the college level. I don't think it is for me. I love the way you feel about your job. I'm sure it makes you an excellent teacher. Our daughter just began her 16th year teaching and our DIL, her 15th year. They are both very much "called" to be teachers and will agree that it is both a hard but rewarding profession. Have a wonderful long weekend!